Ruth Ratner Miller broke the glass ceiling before anyone thought of the term to describe successful businesswomen. She was president of Tower City Center, but business was only one aspect of the life of a woman who also dedicated herself to public service. Miller, 70, of Lyndhurst, died yesterday at Cleveland Clinic Hospital. She had cancer, a disease she had vowed to beat. Miller, who had been fighting cancer for several years, was the eternal optimist, said Cohen. She had scheduled a party for Dec. 12. Her renovation of the Terminal Tower’s lower levels into a glamorous shopping center captured the city’s attention, but she also was instrumental in converting the former Halle Bros. Co. department store downtown into an attractive office building. “She was a tremendous booster of Cleveland and understood the significance of relighting the Terminal Tower,” said Voinovich. Miller, who never held elected office, was Cleveland’s community development director for Mayor Ralph J. Perk from 1976 to 1978 and director of Cleveland’s Health Department from 1974 to 1976. To carry out her goals, she worked 12 to 14 hours a day – spending much of the time out in the neighborhoods – and came to her office Sunday afternoons to catch up on correspondence. Fridays, the Jewish sabbath eve, were always spent with her family, which had long been active in Park Synagogue. At the national level, Miller was on the executive committee of the Holocaust Memorial Museum in Washington, D.C., and was a member of the Holocaust Memorial Council, appointed by President Ronald Reagan and reappointed by President George Bush. “She had the longest tenure [at the museum], through two parties,” said Albert Ratner, her younger brother and co-chairman of the board of Forest City Enterprises Inc., where her uncle, the late Max Ratner, was board chairman. “She was the individual who was able to bring together the survivors and people in the community who had not been victims. 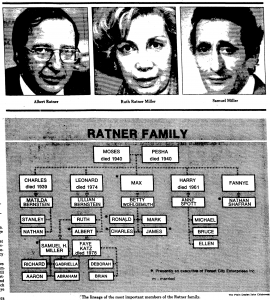 The Ratner family has long been active in supporting Israel. Family members have been prominent in raising money for Israel, as well as money for the Holocaust Museum. Miller was born Dec. 1, 1925, to Leonard and Lillian Ratner, who founded the highly successful Forest City Enterprises Inc. The national real estate giant built and owns shopping centers, office towers, apartment buildings and hotels across the United States, including downtown Cleveland’s Ritz-Carlton Hotel. She earned a bachelor’s degree in elementary education at Western Reserve University and a doctorate in guidance and counseling after the school had become Case Western Reserve University. When she was 20, she married Samuel H. Miller, whom she had met at her family’s summer cottage in Wickliffe. Because she was a minor, she needed her parents’ written permission. The couple had four children. Her marriage to Miller, who later became co-chairman of the board and treasurer of Forest City, ended in divorce in 1982. Miller’s second marriage in 1985 was to Rabbi Phillip Horowitz, father of three children and rabbi of the former Temple B’rith Emeth. She retained the name Miller. In 1980, she was the Republican candidate for the seat of retiring 22nd District Rep. Charles A. Vanik, but lost in the primary to Joseph Nahra by 1,500 votes. She was elected chairwoman of the Greater Cleveland Convention and Visitors Bureau in December 1985. She was a news analyst for WBBG-AM radio for two years, from 1978-1980, and was director of Rapid Recovery, a program aimed at cleaning up Regional Transit Authority right-of-ways, in 1979. She co-chaired the campaign to elect Republican Thomas J. Moyer chief justice of the Ohio Supreme Court in 1986, when he defeated incumbent Frank D. Celebrezze. Former Democratic Gov. Richard F. Celeste appointed her a trustee of Cleveland State University in 1987. She was an occasional lecturer in CSU’s College of Urban Studies. As a trustee, she was chairwoman of the board’s minority affairs committee when CSU President John A. Flower fired Raymond A. Winbush as vice president of minority affairs and human relations. In 1986, Celeste had appointed Miller to the Ohio High Speed Rail Authority, a group assembled to recommend ways to develop a passenger network linking the state’s major cities. Miller served as fund-raising chairwoman for the Greater Cleveland chapter of Aiding Leukemia Stricken American Children. In 1985, she was appointed a member of the U.S. delegation to the World Conference to Review and Appraise the Achievements of the United Nations Decade for Women in Nairobi, Kenya. Maureen Reagan, daughter of then-President Reagan, headed the 34-member delegation. Although Miller received many honors, she said she was especially proud of having been elected by her alma mater to the Cleveland Heights High School Hall of Fame in 1990. Miller is survived by her husband, Rabbi Horowitz; sons, Aaron of Washington, D.C., Richard of Boston and Abraham of Cleveland; daughter, Gabrielle of Wellesley, Mass. ; a brother; eight grandchildren; and five stepgrandchildren.